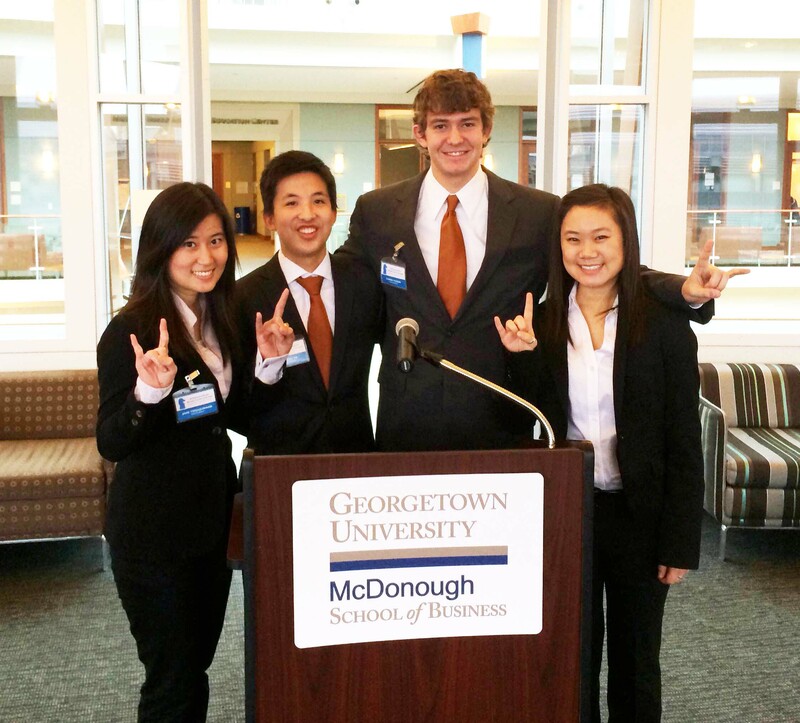 BHP students Robert Ma, Thomas Pigeon, Jane Tedjajuwana and Shannon Wey took fourth place at the McDonough-Hilltop Business Strategy Challenge at Georgetown University in Washington, DC this month. Twenty teams competed, 11 from the U.S. and nine international, in this unique non-profit case consulting competition. This year’s case centered on expanding job opportunities available to members of the National Institute for the Blind (NIB). “The main goal of NIB is to help the blind become independent personally and financially. Our job in the case competition was to find ways for the NIB to open up job opportunities not only within the federal government, but in the private sector and in the service industries,” said Shannon Wey. The team presented a three-pronged solution which involved starting an internship program allowing blind people to get a foot in the door with employers, building a stronger network of partner companies across the nation, and implementing a talent showcase open to companies to show what blind people are capable of with current assisted technologies. The team also enjoyed meeting other competitors from outside of the U.S. and hearing their global perspective on the case. “It provided a really unique experience for all of us. We appreciated how international it was. We met people from Hong Kong, Australia, Germany and Singapore,” said Robert Ma. After taking a closer look at non-profit organizations, all of the team members said they would now definitely consider working with non-profits after college. The trip was not all work. The group managed to find time to visit the Washington Monument, Lincoln Memorial and made sure to make a pit stop at Georgetown Cupcake. This entry was posted in News, Program News and tagged BHP, Business Honors program, Case Competition, McCombs School, McCombs School of Business, non-profit, Texas BHP, Texas Business Honors, Texas Business Honors Program, University of Texas, UT, UT Austin, UT McCombs School. Bookmark the permalink.